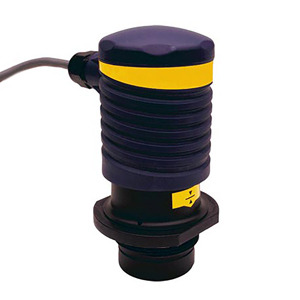 The LVU-201A 2-wire ultrasonic level transmitter is the compact solution for non-contact continuous level measurement in process vessels, storage tanks, and open channels. This loop-powered device provides accurate level measurement up to 5.5 m (18'') and is the ideal choice for more challenging coating or scaling liquids, including sodium hydroxide, wastewater, resin, wax, liquor, and bleach. An ultrasonic sound wave is pulsed 2 times per second from the base of the transducer. The sound wave reflects against the process medium below and returns to the transducer. The microprocessor-based electronics measure the time of flight between the sound generation and receipt, and translates this figure into the distance between the transmitter and process medium below.